Looking out for aggressive and agitated vehicle drivers, anticipating traffic lights, preparing for the vehicle in front of you to make a turn, and determining how slippery a painted line or pool of water might be. Motorcycle riders have a lot to think about as “snowbirds” come back to town and traffic picks back up again. That is why it’s important to review some basic motorcycle safety tips to make sure your next ride is a safe one. Always keep at least a 20-foot cushion between you and fellow riders. Give yourself time and space to react to other drivers around you. Brown and black apparel is not our friend on the road. Wear something bright, or safety neon apparel that is offered by many motorcycle companies, such as neon reflective taping. Make sure to wear protective gear and clothing that will minimize the number of injuries in case of an accident or a skid. Wearing leather clothing, boots with nonskid soles, and gloves can protect your body from severe injuries. 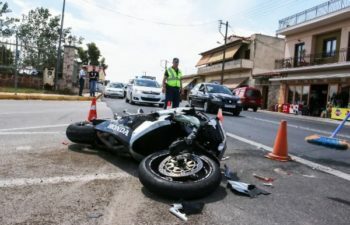 Don’t assume that a driver can see you, as nearly two-thirds of all motorcycle accidents are caused by a driver violating a rider’s right of way. You should always ride with your headlights on; stay out of a driver’s blind spot; signal well in advance of any change in direction, and watch for turning vehicles. The dangers of icy or wet roads multiply when you’re on two wheels. If rain, snow, or ice is foretold, opt for a different mode of transportation. If you simply must ride in the rain, do not ride right after the storm starts. There are certain safety rules that the passenger is sitting behind you must be aware of. Make sure you tell your passenger how to behave while on the road. All they is expected to do is to sit tight and not try any stunts that can prove dangerous to both. Traffic Slowing? Stay Left (Or Right). When traffic slows suddenly, stay to the left or right of the car in front of you. This will give you an escape route if needed. It will also help keep you from becoming a hood ornament if the car behind you fails to stop in time. Once you’ve stopped, be ready–clutch in, your bike in gear and your eyes on the mirrors. You never know. An increase in traffic does not have to keep your bike in the garage. By keeping these safety tips in mind, you can help keep yourself and those around you safe while riding. Have a safe journey. As always, if you or a loved one have been injured and need legal assistance, Call Me on My Cell! Reach out at 813-254-7119 or visit www.CallMeOnMyCell.com!